Thanks for visiting the treefrog identification guide. It starts with pictures and descriptions of the ten treefrog species in the Genus Hyla, or Holarctic tree frogs inhabit the United States. 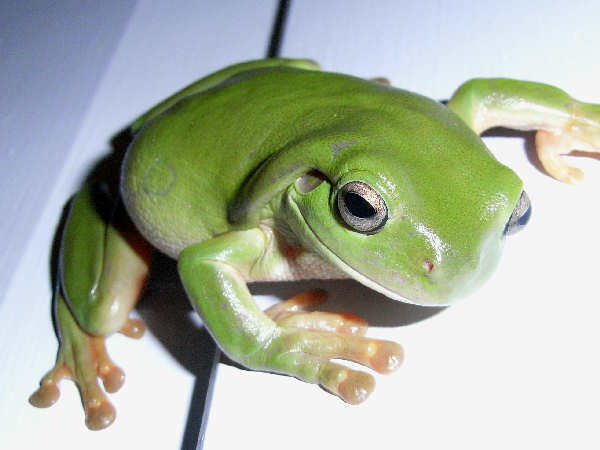 This group has traditionally been considered the true tree frogs based on their geographical diversity. The more formal name Holarctic, for example, means they live in areas of the entire land mass north of the tropics, including North America, Europe and the rest of the Eurasian continent. Another group of tree frogs, chorus frogs (genus Pseudacris) is a distinctly North American group of tree frogs. Please press the button to learn more about the. In the United States, eight of the ten Hyal species are primarily found east of the Rocky Mountains. The top picture shows and Arizona Treefrog (Hyla wrightorum). 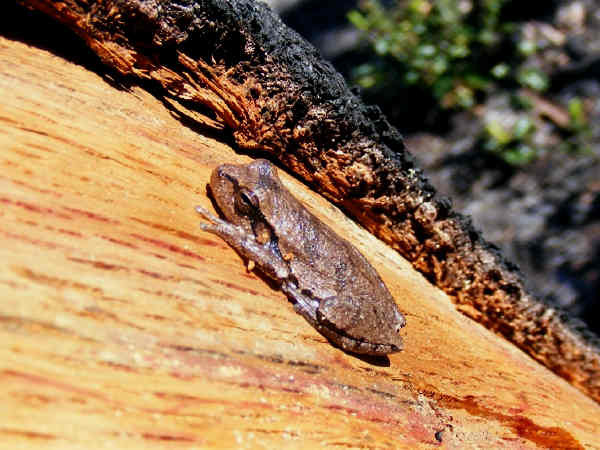 It’s a mountain species of both Arizona and New Mexico, explaining the other common name, Wright’s Mountain Tree Frog. 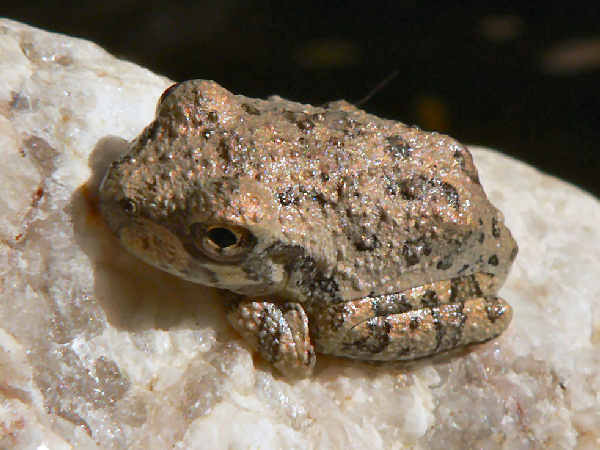 They grow to about two inches in length and are recognized as the official amphibian of Arizona. The Canyon Tree frog (Hyla arenicolor) is the other western species. It inhabits the rivers and stream banks of rocky areas in the desert Southwest. Their diet consists of the aquatic and terrestrial insects in their territory. They are probably the most common amphibians found in the Grand Canyon. In Arizona they are also present in the canyons of Tucson. Pine Barrens Treefrog (Hyla andersonii) have nice looking and somewhat bold purple stripes on the eyes. They are a coastal species that inhabit the pine areas of Mid-Atlantic states from New Jersey south to South Carolina. Pine Woods Treefrog (Hyla femoralis) identification starts by looking for a row of spots on the thigh. The sporadic chattering call of the pine woods treefrog gives it the nickname “Morse-code frog.” It can be heard from April to October. 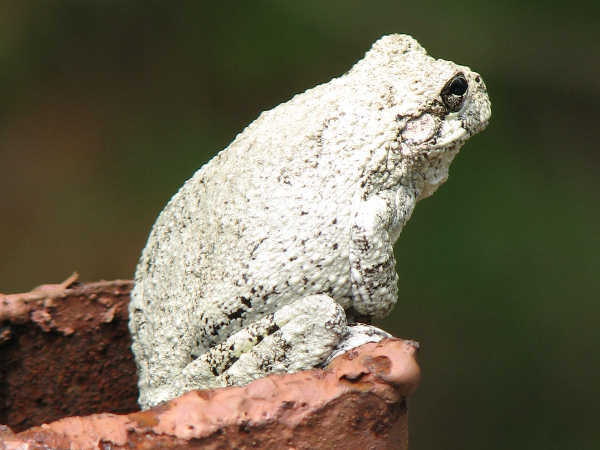 Two Gray Treefrog species are common in the East. 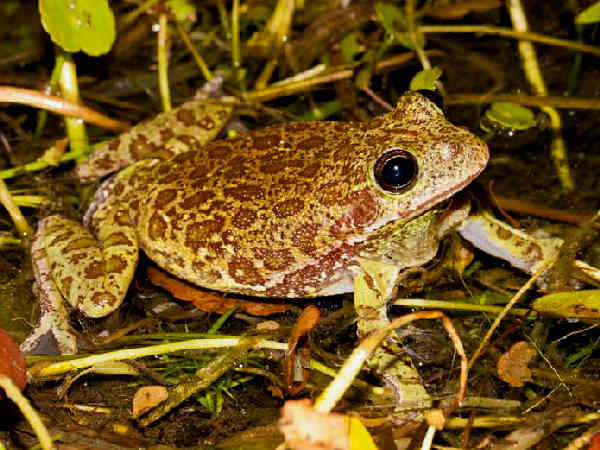 The Cope’s Gray Treefrog (Hyla chrysoscelis) inhabits most areas of the east from north to south. They vary in color from mottled gray to light green but their color can change depending on environment and activity. There is usually a light spot beneath eye and the inner thigh is bright yellow or orange when exposed. With the exception of the Southeast, Gray Treefrogs (Hyla versicolor) are the oher species. The common and formal name describe the physical comlexity of the species. Gray Treefrogs do have gray skin. However, the versicolor formal name also suggests that they have a versitile skin color. Individuals of the species can also be found with green skin. 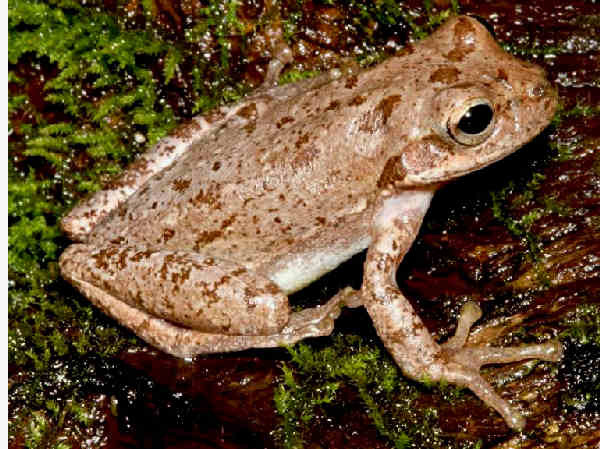 So, any gray treefrog found in the Southeast is a Gray Treefrog, because there are no Cope’s Gray Treefrogs in the area. In all other areas, both species can be found. Only their mating calls differentiate them. 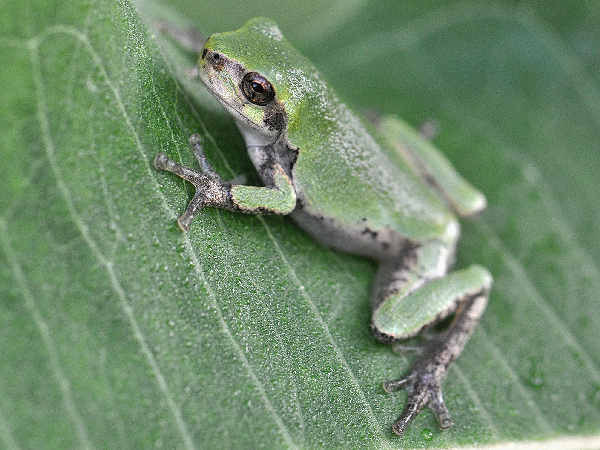 Ranked as one of the most common, and arguably nicest looking of the Hyla tree frogs, American Green Treefrogs (Hyla cinerea) have light green bodies with a yellow strip running along the side. There’s no mistaking their identity. Adaptability is a key element of their commonality. They adapt well to human environments and live in water areas along the Southeast, Gulf Coast and southern areas of the Mississippi River Valley. Look for them in the garden or on the porch during late spring through early fall. 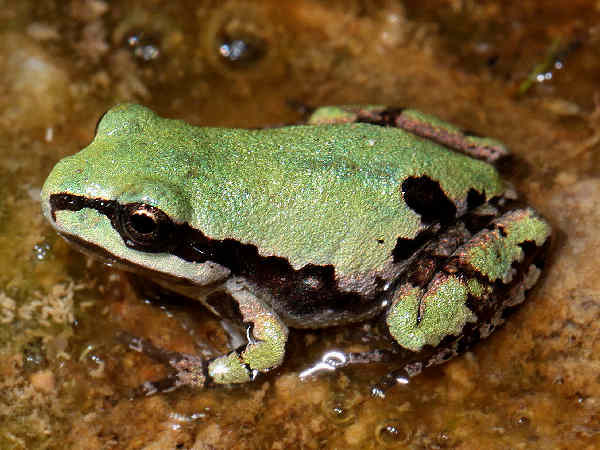 If you are a person that loses sleep over a neighborhood dog that barks all night long, wait until the Barking Treefrog (Hyla gratiosa) arrives. They deliver exactly what the name describes, a mating call that sounds like a barking dog. They are primarily a coastal bunch and inhabit the coastal regions of the Southeast and Gulf Coast. The presence of dark spots on the body is often a good field identification clue given the fact that their body color can change. Bird-voiced Treefrog (Hyla avivoca). 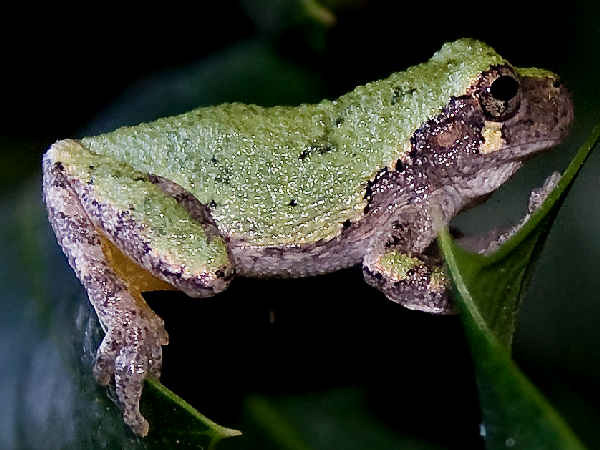 The bird-voiced treefrog is usually a mottled gray color, but like many treefrogs, its color changes fom brown to green depending on temperature and environment. They can look very similar to Gray Treefrogs. It almost goes without saying that hearing their call, a chorus of birds, is the best way to know they are in the neighborhood. Look for them in wooded swamplands of the South, where they can be heard calling during spring and summer. Residents along the coastal Southeast are very familiar with Squirrel Treefrogs (Hyla squirella), though they might not know it. They show up in backyards and gardens everywhere. The problem is that both their skin color and pattern change, making identification difficult. For example, their skink color can range from green to brown. There might or might not be spots on the skin. Finally some might have light stripes on the sides. 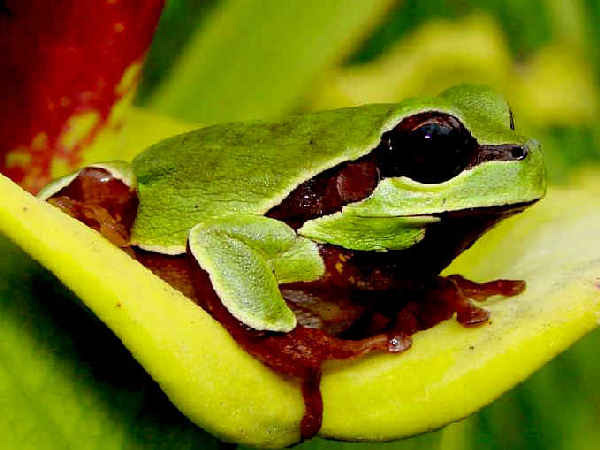 During any one season, the average gardener might think they have four different treefrog species in the year because four individuals look different. The big picture story for treefrog identification is watch. Know the types of treefrogs in your area and then use some base line for comparison. For example, in areas of the south species such as the Gray Treefrogs will have yellow spots on the thighs.